At Impact Trophies & Medals, we offer a fantastic selection of shields & plaques suites to a variety of rugby presentations, tournaments and events. 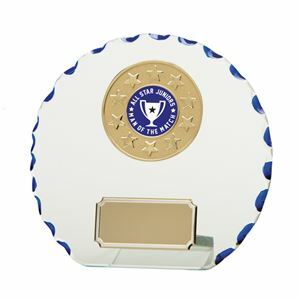 Our extensive range includes budget plastic plaques, individual glass and traditional annual wooden shield awards for regular sports presentations. Impact Trophies & Medals are a leading retailer of shields & plaques for rugby. Great for personalisation, many of our shields & plaques can be personalised with high quality text engraving and a domed printed logo insert for your rugby club or presentation event. 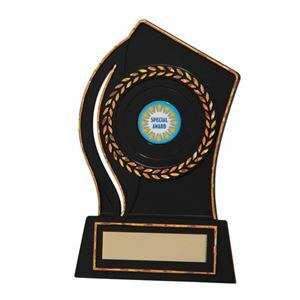 This cost effective trophy is made from quality plastic and varnished with a glossy lacquer. The Quest Black Plaque Award is a black plaque with gold trim and stands on a small rectangular plinth. A golden circular laurel wreath surrounds a printed insert. Mounted on a slim moulded plinth, the Phantom Multisport Plaque features an eye catching circular plaque decorated with a rose effect border. The plaque is cast from a high grade plastic and varnished with a durable coating. Offering exceptional value, this trophy can be personalised, creating a bespoke award for a budget price. The Inferno Multisport Plaque is a small plastic trophy formed into a tear drop shape. The trophy is coated in a gold holographic effect face and features a large ornately decorated round frame. The centre of this frame has been left blank so that a printed logo insert may be applied. Further personalisation may be added in the form of an engraved text plate, creating a truly bespoke award for an excellent price. 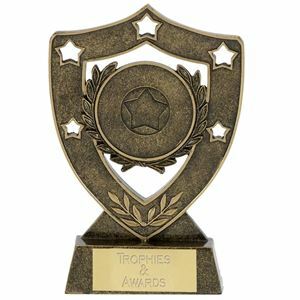 This eye catching trophy is mounted on a slim trapezium shaped base and features a fan shaped background with three cutout stars, cast from a quality gunmetal silver glazed plastic. A gold semi circular shield is mounted in front of the fan which is decorated with stars and embossed detailing. A round recess is positioned on the front, into which a printed vinyl insert of your choice may be applied. This striking Event Bold Blue Plaque is a high gloss rectangular award finished with bevelled edges. This electric blue plaque features a decorative gold emblem depicting laurel leaves within which a logo insert of your choice can be applied. The plaque can be supplied with a FREE separate personalised self adhesive engraved plate displaying your text details and ready to be applied. Would you like the plaque to display your own logo? We can personalise the trophy with a round printed self adhesive logo insert at a small additional charge per order. Either upload the logo with your order now or simply email us later. The dramatic Event Bold Red Plaque is finished in a bright red glossy lacquer. The bevelled edge plaque is set with an antique gold effect circular emblem featuring laurel leaves. within this can be applied a logo insert of your choice, if desired. The attractive Event Ivory Plaque is finished with an ivory washed wood effect, leaving a sheer colour through which the wood grain can be seen. The rectangular plaque is decorated with a gold laurel leaf motif which is designed to hold a circular printed insert, if required. The Wessex Walnut Plaque is a rectangular wooden award, coated with a burnished walnut effect veneer. A circular gold emblem of laurel leaves surround a circular mount, onto which a printed logo insert of your club or team can be applied. Made from high quality resin with a high quality glaze, the bronze shield star award is a shield shape trophy with cut out star decoration. Set in the centre of the Shield Star Award is a laurel wreath a star in the centre. The Direction Plaque is a silver plaque style trophy made from high quality glazed resin. The centre of the plaque holds an engraved plate to make this silver plaque suitable for any award giving.